Vacation in a Renaissance Painting. . .
Il Rifugio... where you will enjoy privacy, serenity and spectacular views. Unwind in this 17th century farmhouse on fifty-six acres of gardens, fields, woodlands and centuries-old terraced olive groves. Il Rifugio is comprised of a seventeenth century stone farmhouse and 56 acres of private land. The house is situated on the edge of an ancient olive grove located above the village of Montanare in the community of Cortona in Tuscany, Italy. Cortona is just 10 minutes away by car. Il Rifugio has two charming buildings: one is the main house, which has ten rooms plus 4-1/2 bathrooms, and the other is a small cottage, a few steps from the kitchen, with a laundry room and a bedroom with a bathroom. Upstairs in the main house are four bedrooms: a master bedroom with a double bed, en suite bathroom and a second bedroom with a double bed and en suite bathroom; two other bedrooms with en suite bathrooms each with single beds that can be made up as doubles; and a common sitting room with a fireplace. Downstairs is a large kitchen with a fireplace, separate walk-in pantry, dishwasher, five-burner stove with two ovens, a refrigerator, microwave, toaster oven, American coffee machine, enough pots and pans for cooking gourmet meals, and an outdoor pizza oven. Also downstairs is a half bath, sitting room, formal dining room and a living room with a large fireplace fitted with a cast-iron wood-burning stove. The cottage has a laundry room with a washer, dryer and deep sink, and a bedroom with two single beds and an en suite bathroom. Il Rifugio can accommodate up to ten people comfortably, with ample space for privacy. There is plenty of garden furniture and a pergola on the spacious stone terrace for eating or relaxing outdoors, with spectacular views of the surrounding olive grove and the rural valley below. Utilities are included in the rental price. Of course the house is completely cleaned and supplied with fresh towels, soap, bed linens and basic supplies before you arrive and every week. Additional maid service during the week can be arranged at a minimal cost depending on the number of guests. Additional services, such as private city and winery tours, Tuscan garden tours, private in-house dinners, cooking school, wine or olive oil tasting, etc., can be prearranged at the time of booking. In 1988 my wife Shirley and I decided to travel the length of Italy by train to Sicily where all of my grandparents were born. It was also a transition time for me as I was leaving the corporate IT world and starting a one person business as a software developer. The seed was planted on that train ride passing through the Tuscan countryside. The rural terrain spotted with old stone farmhouses in varying degrees of decay struck a deep cord within me. The dream faded away when I woke up upon returning from vacation and had a business to get up and running. In 2000 I was getting tired of what I was doing and revisited my dream from 12 years ago. I came to Siana for about five weeks and visited a different town every couple of days. I finally decided on Cortona and came back in 2001 to stay for five weeks to get to know the area and confirm my previous feelings about the town and the area. I talked to some real estate agents to check out the market and have some properties to look at knowing Shirley was coming out later. After looking at several properties we went to see a property we knew was outside of our budget. As soon as we walked on the property it was like getting hit in the chest with two open hands. I was physically taken back and instantly knew this was the property we have been looking for. We just looked at each other and said, 'whatever it takes...' In 2001 we started the purchase process. In 2002 we finalized the purchase and started a cosmetic restoration. In 2003 we had our first guests. Splitting my time between Cortona and Santa Barbara got old, so in the Spring of 2005 Shirley early retired, I wound down my business, we put our house in Santa Barbara on the market and moved here permanently. We were never running away from anything but rather running to something we found in Cortona. We very much like the culture, lifestyle and of course meeting and accommodating our guests. Any regrets? Yes. I wish I did it 20 years sooner. There is a very efficient cast iron wood burning stove set on the hearth of the large living room fireplace. (2) There is a fireplace in the kitchen where you can cook and a fireplace in an upstairs sitting room. Two ovens in the stove. Conventional and convection. American style coffee maker and and Italian stove top coffee makers. Please see our web site for more details on our optional guest services. The kitchen is large and well equipped with a professional stove, dishwasher, fireplace, island and a separate walk-in pantry. The pool is located on a terrace above the house in a very private area with spectacular views of the valley below. Il Rifugio is located just outside of Cortona (less than 10 minutes). The owners, Chuck and his wife, Shirley, have taken care to make Il Rifugio a home away from home - wherever you may have come. 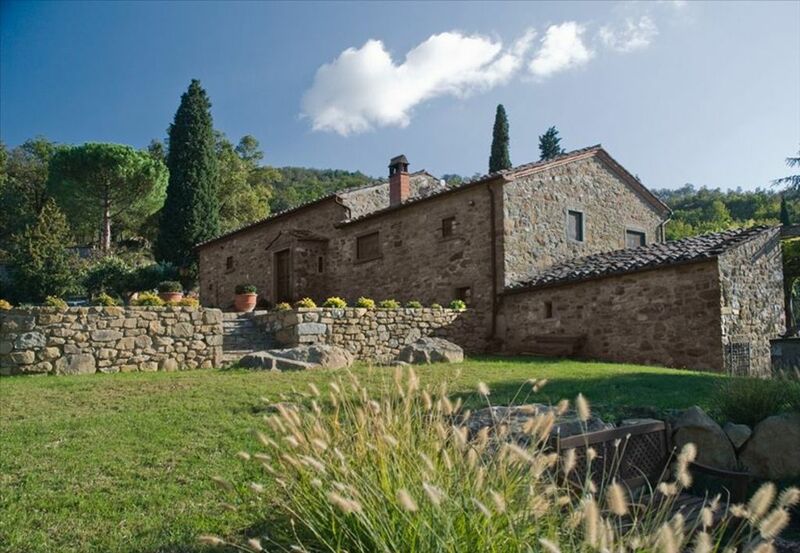 The location of the property makes it a great home-base for day trips around Tuscany - however the beauty and tranquility of the property makes it easy to just “stay at home”, relax and unwind with friends and family. The large kitchen is equipped with anything you need - and the herb garden makes for amazing touches to any meal. Each of the five bedrooms has it’s own bath with toilet, sink and shower (the master also having a large tub). Most of the rooms can be set up with either a queen or two singles - making it perfect for our group of ten adults. There are multiple large seating areas around the house, both inside and out, allowing you to make any meal special. WiFi is strong throughout the house - including around the pool - making it easy to stay connected to work...or post those amazing sunset pictures to whatever social platform you like to share. A fully functional washer and dryer (and clothesline) make it easy to pack light for a week in paradise. Shirley is an established chef who created some wonderful meals for our group. She also showed the patience of a saint as she led seven of us through an AMAZING Italian cooking class. Chuck was quick to respond to any requests, inquiries, etc. He provided recommendations for restaurants, day trips, etc. He also set up two local wine tastings and an olive process tour and meal. We all look forward to a return trip in the not too distant future - and will be recommending Il Rifugio to all of our friends and family looking for an amazing place to stay in Central Italy. Excellent country location close to Cortona and other Tuscan destinations in a well manicured, aesthetically beautiful villa. We were there during their olive harvest and were able to go to the mill and witness the pressing of extra virgin Tuscan olive oil....the best in all of Tuscany. The villa is spacious with no detail overlooked. At sunset the view from the patio overlooking the valley was absolutely stunning. In our twelve trips to Italy "Il Rifugio" was by far the nicest place we have stayed. We would definitely return for another visit.. Excellent and well organized and laid out retreat. This is the place to stay if you want a view, multiple outdoor and indoor meeting, eating and relaxing spaces, swimming pool and a kitchen for home cooking or chef prepared meals. The view is incomparable and can be accessed from many different rooms and bedrooms. For small or large groups this is the place to be. WOW! What a wonderful retreat! This house is fantastic!! We visited for one week in September with some friends and we had the best experience ever! Especially enjoyed the outdoor patio and it's magnificient view! The house is quiete. is very well located, has a beatiful pool and landscape and is an excellent value for the location. The owners and the manager are very helpful, the place is very well mainteined and clean. The stay was truly incredible and we'll definitely be back. How do you say amazing in Italian. This is the spot. Would be triple money a week in US. Everything you need and all you've imagined. Don't look any where else. Rent this place. Bring family or friends and enjoy. All prices are in US Dollars based on an occupancy of up to ten people. There is a tourist tax we are obligated to collect for the city of Cortona. The tax is 2 Euro per person per day for the first 4 days of any stay. For example; the tax for a group of 6 people staying at Il Rifugio for one week would should pay 6 people X 4 days X 2 Euro = 48 Euro.